At Market Street, we continually assess and reassess a variety of metrics to determine the best measure for a variety of attributes that impact local economic competitiveness. Some metrics are relatively straightforward, such as population, job growth, diversity, and workforce sustainability. Others require a combination of data, local knowledge (gleaned from public input), and a bit of expertise to deduce what is actually happening in the local economy. The fact of the matter is, for some indicators, there is always a discrepancy between the knowledge we wish we had and the knowledge that is available from public and private data sources. Innovation falls within the latter category, Federal reporting standards tend to lag behind a continually evolving economy. The Office of Management and Budget adopted the North American Industry Classification System (NAICS) in 1997, and for the first time, employment data for information services, healthcare delivery, and high-tech manufacturing were identified as separate industries. Industry sectors added by the shift from Standard Industrial Classification (SIC) to NAICS classification systems included semiconductor and related device manufacturing, cellular and other wireless telecommunications, satellite telecommunications, and internet publishing and broadcasting among other inclusions. With the shift, economic development professionals gained a more nuanced view of their local economies, which in all likelihood, were heavily impacted by the information technology revolution. This is of course not to say that the Federal agencies are not adaptable in light of shifting economic tides. The Bureau of Labor Statistics made quick progress in defining and collecting information regarding Green Jobs after the Obama administration made a concerted effort to grow the sector. Inception to data collection took about a year and four months (January 25, 2010 to May 24, 2011). Having worked on a Green Job’s survey during an internship at the Council for Community and Economic Research (C2ER), I can tell you deciding what a green job is and how you measure it is fuel for a lengthy debate. There is another ambiguous term floating around in the national lexicon: innovation. At its core, innovation is fairly simple: it is the act or process of introducing new ideas, devices, or methods. But measuring this, measuring its economic impact, and its future potential in a local economy is extremely difficult. Often times, measuring innovation requires a collection of data points, an assessment of local higher education capacity, and local knowledge obtained through intimate contact with the community’s leaders and innovators. In terms of publicly available data, however, there is probably no other more controversial innovation data point than the patent. Patents, according to the United States Patent and Trademark Office, offer certain rights to the inventor for up to twenty years, during which time the inventor may exclude all others for making, using, importing, or selling their invention. In exchange, the information is disseminated to the public. At its core, the patent serves the public good by incentivizing the exchange of information. Without the patent, companies may have to reinvent the same technologies that have already been discovered provided the original inventor was able to keep the technology a secret. Had every semiconductor company been forced to reinvent the transistor, the centerpiece of the information technology revolution, it’s unlikely that the growth of the IT industry would have occurred at the pace in which it unfolded. Patents, simply put, is one of the only methods our society has created in order to codify an idea. Leveraging patent data, however, presents a few challenges from determining the innovation potential in a local economy. The most glaring challenge is that all patents are not created equal. Some protected ideas are the foundations for multibillion dollar products, others hold no commercial value. Others still are valueless until they are combined with other ideas and technologies. Between 2000 and 2012, Apple filed 1,298 mobile technology patents according to a September 2012 Thomson Reuters report. While it is difficult to assess the economic value of each individual patent within the portfolio, the combination of patents (and trade secrets) resulted in a product that is estimated to have generated $150 billion for Apple. In terms of the local innovation economy, clearly being able to distinguish the valuable ideas from the valueless would go a long way in assessing the overall health of the local innovation economy. Yet, patents present other challenges as well. For instance, the mere fact that a patent is created in the local economy does not necessarily mean that the local economy will benefit from the production of the patent. Again, using Apple as an example, while the majority of their design functions are located in California the actual iPhone is made all around the globe. Housing this production activity in California would certainly increase the overall economic impact of the iPhone within the state. Another, albeit ancillary challenge, is the rise of the patent troll. Patent trolls are essentially companies who acquire patent portfolios with the intention of suing other companies for infringing upon those patents. Patent trolls have become so effective that many state legislatures are passing laws to curtail the practice. These acts relegate the economic value of an idea to whatever the patent troll can obtain through the litigation, again, providing limited economic benefit to the local economy. Despite its shortfalls, patent data does provide for some really interesting information regarding the nature of the local innovation economy. Connecting individual patent inventors via social network analysis can lead to a greater understanding of the knowledge flow within the regional workforce and how your region is connected to the nation’s overall innovation system. Patents are also a legitimate metric for determining idea generating activity and reflect a degree of economic potential, however, there still needs to be some way to assess their overall economic impact. Innovation is a loosely defined concept. So too are its measures. As it stands, the economic development profession seems to take a “we know it when we see it approach,” it’s a combination of local knowledge and federal data that paints an overall picture of the local innovation economy. Just as the Bureau of Labor Statistics embarked upon a year-long mission to define Green Jobs, it is perhaps time that we as a profession define innovation and communicate what information we need from federal, state, and local agencies to better assess our current and future potential in our innovation-driven economy. There’s a good chance that you didn’t celebrate National Bike to Work Day. After all, only about one percent of workers nationwide commute by bicycle. But the number of Americans who bike to work jumped by about 60% since 2000, according to a report from the U.S. Census Bureau and it could be much higher. So why don’t more Americans bike to work? Most people would probably put safety at the top of the list. And in Texas, where I live, it’s often too hot. I’m talking 40 to 60 or more consecutive days at 100 degrees or higher hot! But bicycle lanes are more and more common making safety less of a concern. And businesses are installing showers and lockers to accommodate employees who bike to work. The Greater Waco Chamber’s “first green chamber building in the U.S.” has a shower for staff and its bike rack was the first installed in downtown Waco. The two amenities were included in the building’s plans as a perk for employees. They also helped the Chamber building earn LEED-Gold certification by the U.S. Green Building Council. 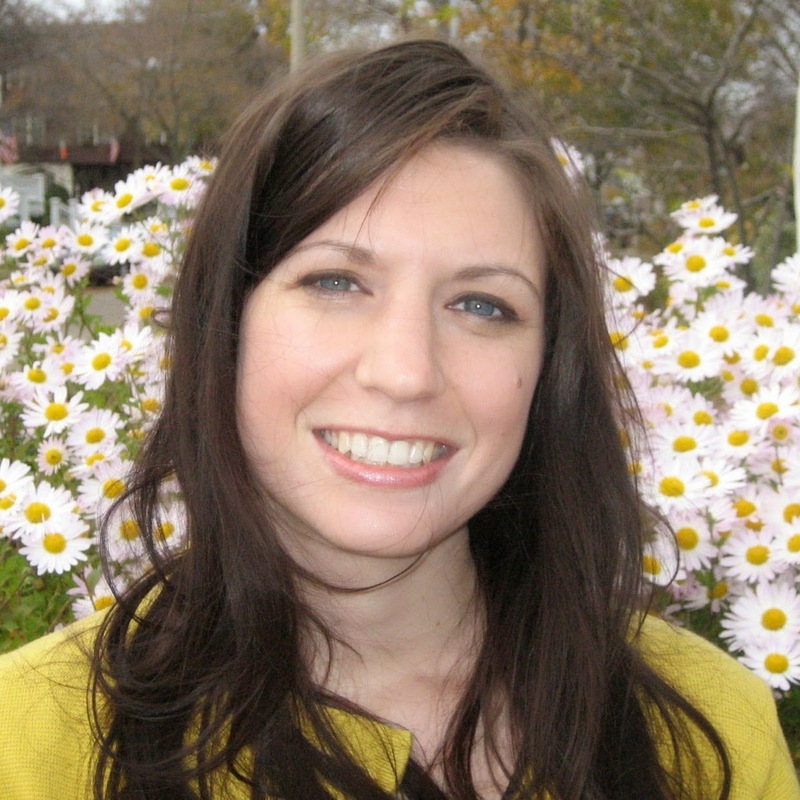 But so few people ride bikes to work in Waco that when Megan Henderson, director of the downtown development corp., snapped on her helmet and peddled out in the street for the four-mile trek to work, it was page 1 news in the Waco Tribune Herald. The only negative reaction she had was to the honking trucks on Fifth Street, the Waco Trib reported. Maybe that’s why we don’t ride bikes to work. In too many cities it’s an unpleasant experience. Full disclosure—I never rode a bike to work. In fact, the last time I rode a bicycle was in Portland, Oregon in 2010. We were in Portland for an InterCity Visit organized by the Greater Waco Chamber. After hearing that 6.1 percent of Portland commuters bike to work, about half of our delegation opted for a bicycle ride through downtown, across the Willamette River and through several residential and commercial neighborhoods on the east side of the city. I was challenged by a few hills and was glad our guide stopped from time to time to give us a break. But the interesting and scenic route made for a pleasant ride through a great American city. What’s needed now is a Pleasant Experience Score! The narrative should by now be familiar: cities are on the rise and suburbs are suddenly playing catch-up as the preferences of Americans – millennials in particular – shift toward housing options in dense mixed-use communities. Within the past month alone, the The New York Times and Time Magazine have each offered up a variation of this theme. But, naturally, not everyone agrees. Skeptics contend that the trend is overstated and/or a temporary condition that will subside as the housing crisis fades and millennials start families and flock to suburbs with strong school districts. Who is right? If survey data is to be believed, consumers seem to want to live in more compact, walkable, mixed-use places (as previously covered in this space by Jim Vaughan). But the trend is difficult to follow through population and migration trends because these statistics tend to lag reality by a year or more and are often not available at sub-county levels, making fine-grained analyses difficult. And of course there is the matter of past results not guaranteeing future performance. All told, the picture is just murky enough to where both sides can make reasonable arguments. But in economic development, the debate is far from trivial. Quality of place plays an enormous role in the attraction and retention of talent, and to be competitive, communities must offer the types of environments and housing products that top workers desire. With that in mind, economic development professionals should endeavor to gather as much information as possible on the topic to help inform decisions. One potential way to do this is to consider where new housing units are being built within a region as a gauge of where the market is moving. Fortunately, this is relatively easy to do with data from the U.S. Census Bureau’s Building Permits Survey. The survey provides monthly and annual totals of new housing units authorized by building permits – both single- and multi-family – for a variety of geographies, including those at the county and sub-county levels. Even better, the survey has a relatively short lead time (preliminary data are already available for March 2014). Best of all, HUD’s State of the Cities Data Systems (SOCDS) provides a quick and easy way to access statistics going all the way back to 1980. To illustrate how this information can be useful, I conducted a brief analysis of the Metro Atlanta area. I compared the proportion of residential units approved in the City of Atlanta (shown in green on the following map) to the MSA as a whole (which includes all 29 counties shaded in red). Atlanta has a reputation for sprawl and the city itself is small, comprising just 1.6 percent of the region’s total area. Not surprisingly, a large majority of the building activity has occurred – and is occurring – outside of the very core of the region. But the gap is narrowing. In 2013, the city captured a larger share of building activity than it has in any year since 1980, with 22.8 percent of all residential units being permitted within its limits. That’s a rather large share for such a small area. And as the following chart shows, this strong performance may be a part of a more long-term trend. 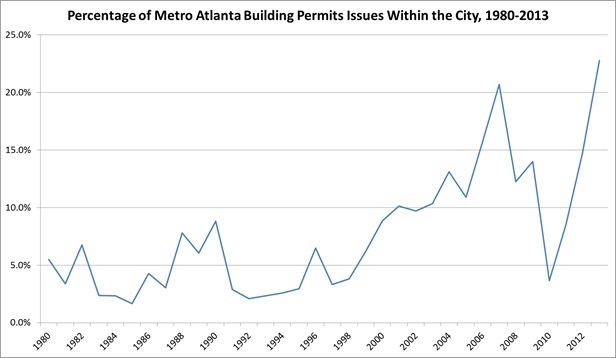 In the years leading up to the real estate crash, Atlanta’s share of building permit activity showed steady improvement, but the trend rapidly reversed with the onset of the Great Recession. This is likely due to the fact that the overwhelming majority of units permitted within the city are in multi-family developments that require institutional financing to build (multi-family developments accounted for 91 percent of permitted units in 2013). Such financing was virtually unavailable immediately following the financial crisis. But between 2011 and 2013, the number of units permitted within the city increased by an astonishing 652 percent compared to a 137 percent growth rate in all other areas of the region. There are caveats, naturally. In terms of raw numbers, there were far fewer units permitted in both the city and the region in 2013 relative to the pre-recession boom years – the city’s gains have been relative. This information also says nothing about how well these developments are doing, who is living in them, or whether the trend will continue. Real estate is cyclical, and Atlanta is in the midst of an apartment boom that will almost certainly fizzle at some point in the near future. But we can say that City of Atlanta is attracting the region’s residential development growth at an unprecedented level. From that we can infer that developers and investors increasingly believe that these are the types of environments that people want, and that’s something that economic developers in the region ought to know. I have lived in Georgia for over twenty years now, coming here in 1993 to run the Governor’s Development Council. I am saddened by the negative direction that this state has taken in the past few years. The most important example of that failure was contained in the headlines of two front page articles in the Atlanta Journal Constitution on April 16. Here they are: “College Costs Rise Again” and “Tech Talent Shortage Takes Toll on Georgia.” It does not take a rocket scientist to connect the dots. A logical question would be what is the leadership doing? The data behind these headlines paints a clear, sad picture. Gone are the days when Georgia led the nation with the innovative HOPE scholarship which paid all tuition, books, and fees and provided a Pre-K space for every four year old child. HOPE now only covers 60% of the costs for our best students. Once, every school district in the state and all students spent 180 days in class, class sizes were shrinking, and the teacher pay was at the national average. All of that is history. Georgia has drastically cut funding from Pre K – 12, technical colleges, and the university system. In another front page article on May 2 this headline appeared, “Tech Schools the Latest to Hike Tuition.” In 2009 the average annual tuition cost for technical colleges was $1,620. In 2014 that number is $2,670, a 64% increase. The state funding of our technical colleges has dropped to only 44% from 60% in 2003. Georgia Tech’s tuition is up 41.5% in the past five years and the University of Georgia is up 36.5%. This is in a state that has seen its per capita income increase by only 7.5% since 2007. The second headline article quoted Eric Shelley of Home Depot (which is headquartered here), “At the end of the day, we don’t have the talent pool in Georgia.” So Home Depot put its new technology centers in Texas and California. Seven major corporations, including NCR and Porsche, spoke at that meeting all, with the same message: Georgia can’t compete on talent. All of us in the economic development business know the number one issue for companies of all sizes is the quality of the workforce. Great schools create great talent. Someone in Georgia needs to have the courage to speak up and connect the dots. We can’t simply cut our way to prosperity.